Please share this story with friends and family….This is a story about a young woman, Tawny Willoughby, and her willingness to share her journey that started with a TANNING BED!!! If anyone needs a little motivation to not lay in the tanning bed and sun here ya go! 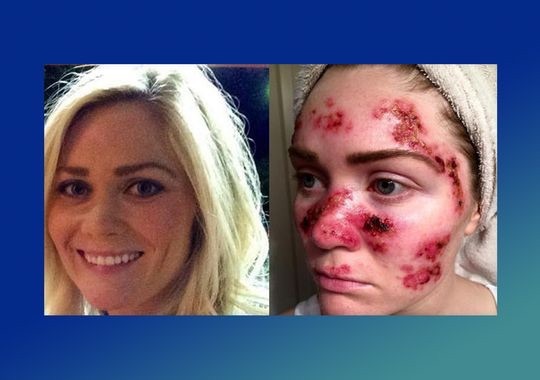 This is what skin cancer treatment can look like. Wear sunscreen and get a spray tan. You only get one skin and you should take care of it. Learn from other people’s mistakes. Don’t let tanning prevent you from seeing your children grow up. That’s my biggest fear now that I have a two year old little boy of my own. Edited to add: To answer a few questions and comments I’ve seen, I did the bulk of my tanning in high school. I probably laid an average of 4-5 times a week (I laid frequently because my tan faded very fast). I never laid in the tanning bed and in the sun in the same day. I never laid in the tanning bed twice in one day. I had my first skin cancer diagnosis at 21. Now, at 27, I’ve had basal cell carcinoma 5 times and squamous cell carcinoma once (excluding my face). I go to the dermatologist every 6-12 months and usually have a skin cancer removed at each checkup. I’m very thankful to not have had melanoma! Skin cancer is not always moles, only one of mine have been a mole. Get any suspicious, new and growing spot checked out. Anything that doesn’t heal, possibly bleeds on and off and crusts. The sooner you find it the less likely it will leave a disfiguring scar or grow deep enough to metastasize. Melanoma kills, non melanoma disfigures (and can also kill). Don’t be a statistic! This treatment was done using a cream called Aldara (imiquimod). I’ve also had the following treatments: Curettage and Electrodessication, Cryosurgery (freezing with liquid nitrogen), Surgical Excision and Photodynamic Therapy (PDT). I’m happy to answer any questions you have about my story and skin cancer in general!